My company has summer hours, which means, I can pop smoke at 1 PM. When Steve Taylor, a cyclist whom I connected with through Instagram said that he would be spending another week this year in Newtown, I suggested that we get together for a gravel ride in Litchfield County. I gave him a couple of routes to explore on his own but if you are going to ride gravel up here, you really should have a guide. The one thing that had me a little nervous, however, was the weather. According to the weather channel, it looked like we could get a shower or two around 5 PM. I picked up Steve from his Air BnB and we headed up to the Roxbury Market. There we met Andy Engel and Ben Maxwell. We got on the road and headed north via Judds Bridge and then up the Shepaug Railroad bed, through the tunnel and on to Washington Depot. It was a spectacular day. Riding through Washington Depot, you'd think that there was no chance or rain today but it seems to be Monsoon Season in Southern New England this week and one minute it can be like this and the next we could get a thunderstorm and then it's raining cats and dogs. Riding through the tunnel is fun but riding through Hidden Valley always seems to be a little more exciting. Not sure if that's because of the railroad bed and proximity to the river or the remoteness of the location. The rocks on the trail were really greasy and everyone was taking it easy. There is one little bridge that I have ridden before but given today's conditions my pucker factor was up and at the last minute I decided to walk it but my dismount, on the bridge, was bad and I ended up going over somewhat. The only thing that stopped me from going over completely was the three teeth of my big ring digging into my leg. When we came out onto Romford Road we got a brief shower and then as we were climbing up Whittlesey it became a light shower. At the top, we stopped for a snack under a big Oak tree that provided some cover. I was literally stuffing my face with this awesome homemade energy bar that Steve makes when he took that picture. He brought one for all of us and it was insanely good. Lots of different nuts on the outside and dried fruit on the inside made for the perfect all natural energy bar. 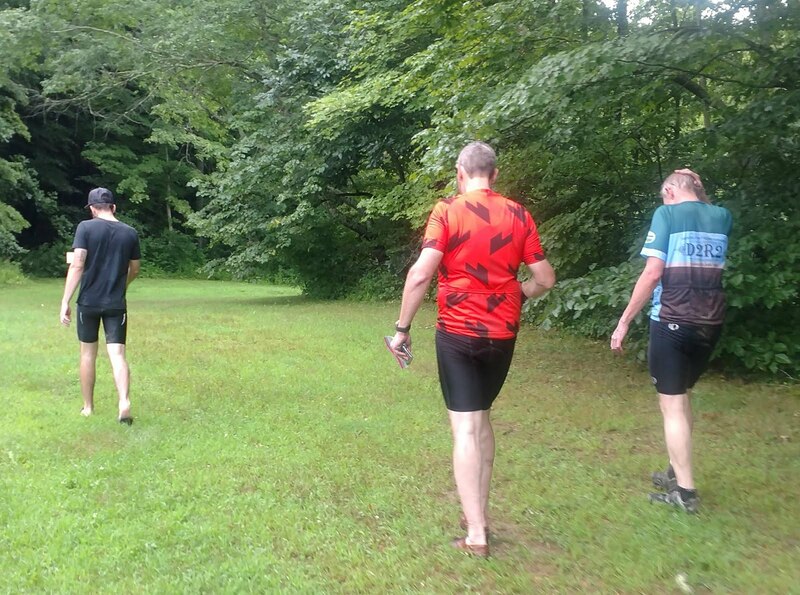 The rain had tapered off a bit while we were riding down Rt 202. Then we took to Flirtation Avenue and it started raining lightly again. Passing by the town beach on Lake Waramaug the light shower started to get heavier and then rounding the bend on West Shore Road it became a full on downpour. I thought about trying to find a tree to hang out under but I was so soaked it wouldn't really have mattered so we pushed on to the brewery. At the brewery there were some other cyclists who had ridden from Litchfield but they were much more dryer than we were which means they probably only got a light shower before getting to the brewery. It was the perfect temperature in the brewery. The rain never let up and after a few lightning flashes and a power flicker, the rain just got steadier and heavier. I had the Danny Boy, a German styled lager, which tasted great. I decided that is what I will be taking home in my Hydro Flask only to find out that the flask was leaking. So I treated Ben and Andy to another round! We put on our rain jackets because it was still raining when we left and started climbing up Camps Road and then climbing even more up Gunn Hill. 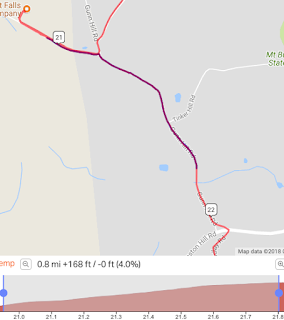 The hill on Camps combined with the climb up Gunn Hill is a 4% average grade for almost a mile. The pouring rain made it all the more difficult. Then we bombed down Finlay Road, cut across 202 and then made our way over to Chestnut Hill. The climb up Walker Brook was nice and the rain actually started to taper off somewhat. The descent down Walker Brook was a blast but the grime from the dirt road was nasty. Steve had fenders on his bike so he was pretty clean by the end of the ride, but not for the rest of us. My trunk bag acts like a fender but does nothing for the rest of the bike. 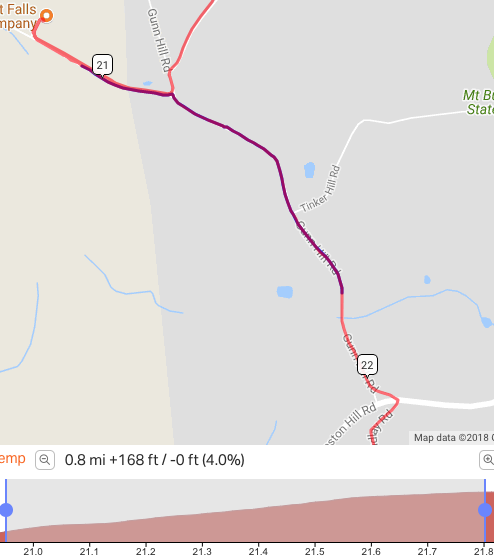 Andy suggested that we go for a post ride dip near the Shepaug and I thought I heard him say at Roxbury Pond, so we drove down River Road to the parking area. One look at the pond and I said no way am I going into that quagmire but then he said, we are going to a swimming hole past the pond on the Shepaug River. While the water silty from all the rain it felt great! Need to remember this place for future post ride cool downs. Epic ride, Mark! We got a little of everything that makes cycling great. Thanks Andy. The swimming hole on the Shepaug was awesome. After a hot ride some weekend I am hitting that place with a six pack of beer from market. 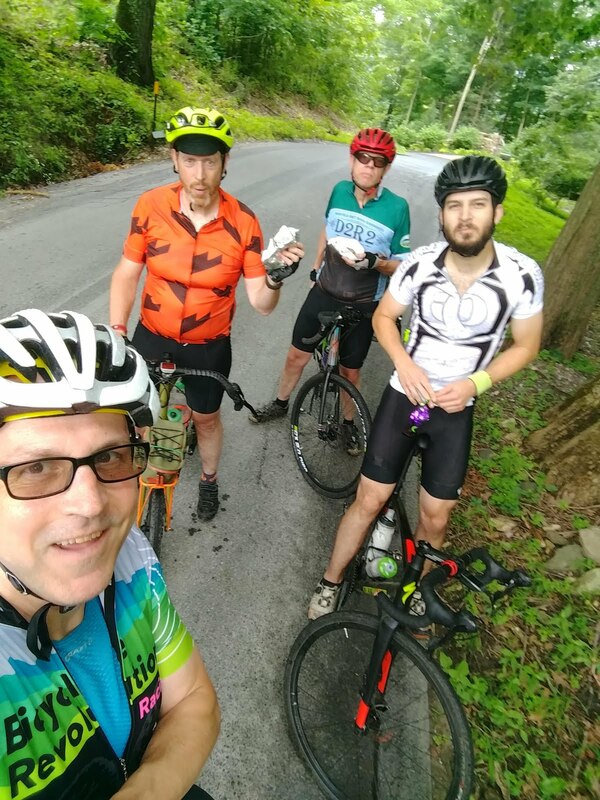 Thanks again for leading a great ride and for all the excellent routes you shared, Mark!